Transfer rates up to 220 MB/s, high-quality, on-the-go storage enhanced by a durable design and exceptional reliability. STEH2000301 Transfer rates up to 220 MB/s, high-quality, on-the-go storage enhanced by a durable design and exceptional reliability. You've never had so many options, and it's never been so easy to choose. 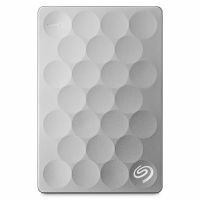 From the latest Ultra Slim and popular Slim drives, to the ridiculous capacity and performance of the Portable and Fast drives, you can always rely on the Backup Plus family. And all Backup Plus drives come with cool features, including Seagate Dashboard and Windows/Mac compatibility. So stay on the move and safely take along your documents, photos and videos. Personal Cloud: Personal Cloud is a cool, secure place to load and store all of your favourite music and movies along with a lifetime of photos. Personal Cloud home media storage allows you to create your very own cloud that is accessible outside the home. Organize all your family’s photos, videos, music and important documents in one secure central location on your home network, and back up not only all your PCs and Macs, but your cloud services as well. To Recieve updates and possible rewards for Seagate Ultra Slim 2TB (Gold) please sign in. To Recieve updates and possible rewards for External Hard Drive please sign in.